The AWE® helmet has been designed to absorb impact damage and shock resulting from the kinetic force of a fall, the helmet may well suffer partial or total destruction, or a fracture or breakage of the shell. Should this unlikely event happen the helmet can no longer be used, even if the surface of the helmet appears to be intact, the helmet for safety reasons should be replaced. 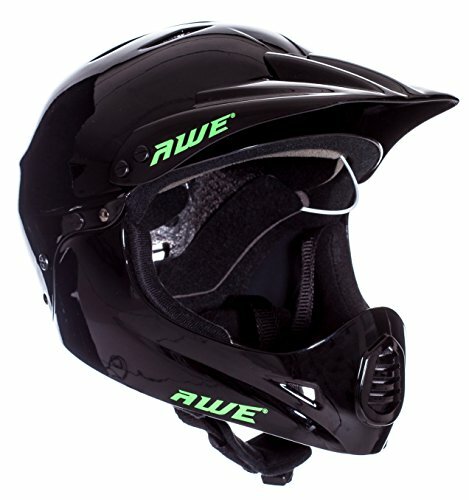 * = AWE Helmets offer a unique 5 year crash replacement policy only on the original helmet purchase, i.e. this is not available on any replacement helmet already discounted as a result of the crash replacement offer. The scheme offers customers the chance to replace their helmet at a 50% discount off their original purchase price, proof of purchase is required. Carriage charges must be paid by the customer and will be advised prior to any replacement. NB: AWE helmets will only offer the warranty on helmets that have been genuinely crash damaged in a genuine nature and reserve the right to inspect crash damage, any crash replacement helmet will be strictly at the company's discretion only. General wear and tear are not covered by the crash replacement policy. The helmet once replaced will not be subject to any crash replacement policy. TESTING APPROVAL: Conforms to USA helmet Safety regulations CPSC And European CE EN 1078:2012+A1:2012 to ensure maximum safety. NB: Not Suitable For Downhill Riding / Racing Or For Motor Vehicle Use. Road Bicycle Use ONLY!! If you have any questions about this product by AWE, contact us by completing and submitting the form below. If you are looking for a specif part number, please include it with your message.